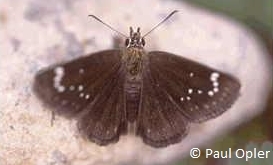 Identification: Upperside is glossy black; forewing has many white spots. Underside of hindwing is blue-gray with contrasting black veins. Flight: Two broods from May-August. Caterpillar Hosts: Amaranths (Amaranthus) and lambsquarters (Chenopodium). Habitat: Open areas such as gulches, canyons, roadsides, and along railways. Range: Central Colorado south through New Mexico to Oaxaca, Mexico. A rare stray to South and central Texas. Conservation: Populations in the United States should be located, monitored, and their habitat needs ascertained.